United States of America and they noticed that it was quicker to fly to the UK, reporting tailwinds of over 100 miles per hour. These winds blew in narrow ribbons and were named 'jet streams'. This abrupt change in temperature causes a large pressure difference, which forces the air to move. In our latitude the jet stream is generally found at around 35,000 feet and is called the Polar Front Jet Stream. The polar jet stream, as its name implies, separates the cold polar air to the north and the warm sub-tropical air to the south. With the temperature contrast of these air masses greatest in the winter time, the jet stream is stronger at this time of the year, reaching 300 miles per hour (but have been measured at over 400 miles an hour in southwest Scotland). Jet streams are typically thousands of miles long, hundreds of miles wide and a few miles deep. The strong winds along the jet stream generally blow from west to east due to the rotation of the earth. That is why, especially in winter time, flights from the USA often land early in this country as they are blown along by these very strong winds. (Incidentally it is also the reason for some "bumpy" rides with clear air turbulence). Planes never land early going the other way. Jet streams move north and south too, following the boundary between warmer and colder air. The wind direction in the jet stream can change from the normal west to east to almost north to south. 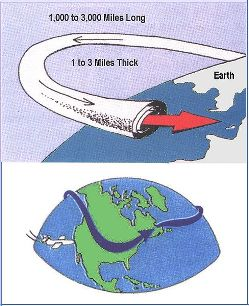 This is one of the methods that the Earth uses to transport excess heat from the equatorial regions towards the poles, and in turn bring cold polar air southwards. It also helps to steer our Atlantic weather depressions from their normal eastward movement. At times it can even block their movements altogether. The Jet stream also helps to steer our Atlantic depressions from their normal easterly movements. If the jet stream moves south of the UK then the cold wet depressions will then get "trapped" over the UK as happened in June / July 2012. While the North Atlantic jet stream generally points roughly due east, straight across the Atlantic, it often meanders north and south. These meanders are the signature of so-called Rossby waves, which are similar to the familiar waves on the surface of water. However, instead of water moving up and down, Rossby waves consist of large air masses, often thousands of kilometres across, moving north and south. When an air mass moves north it starts to spin clockwise (when viewed from above), forming what’s called an anticyclonic weather system, a high-pressure system associated with settled weather. When air moves south it spins anti-clockwise and becomes cyclonic, a low pressure system which is prone to wet weather. A Rossby wave can therefore lead to a string of alternating high and low pressure systems, with the jet stream snaking around them from west to east. Like water waves, Rossby waves generally move relative to an observer on the ground, and this movement leads to changes in the weather from week to week. 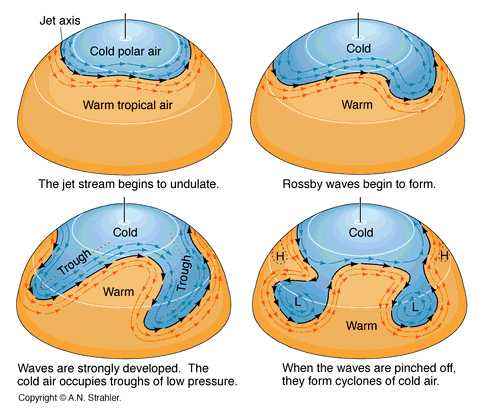 In fact, the Rossby waves themselves always move towards the west, which means they are always swimming upstream against the eastward-flowing jet. If conditions are right and the wave speed matches that of the jet, the wave will remain stationary. Then the high- and low-pressure systems are no longer moving relative to the ground, and a persistent weather regime is born. The winds in the jet stream do not necessarily blow at a constant speed or in a straight line. Within this fast moving air there are accelerations and decelerations as the air speeds up, slows down or in fact changes direction. It is at these points in the atmosphere that high and low pressures starts to form, and either moves quickly in the wind flow, or develops into a bigger depression or anticyclone. These positive or negative acceleration points are very important to the weather forecaster and these occur at the entrance and exits of the jet stream. This is the fundamental way that forecasters use jet streams to try to predict whether and where a rain-bearing depression will form, and if it forms whether it will develop into a full blown storm which may cause structural damage as it rushes in from the Atlantic, or whether it will just be a little blip in the fine weather that rushes along at 60 miles per hour.